Published on January 14, 2016 by Martyn. Be the first to comment! It’s always a pleasure to drop in on one of my very favourite schools – Scissett Middle School, near Huddersfield. 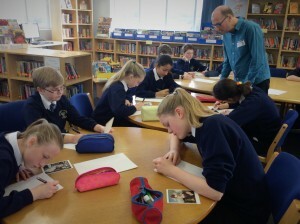 So, I thought I’d share a couple of pictures from a recent visit, when I ran writing workshops for two Year 8 groups. The stories they’ve written in response to the sessions have now been entered into a competition which the school has asked me to judge. I’ve been to Scissett several times over the years, to run workshops and give talks and readings. The staff always make me very welcome and the students are reliably attentive, engaged and a real pleasure to work with. A credit to themselves and to their school. 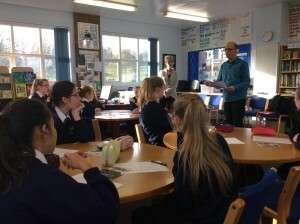 Indeed, two characters in my upcoming YA novel, Twenty Questions for Gloria, are named after two of the school’s former students, as a prize for a competition I ran at Scissett a couple of years ago, and in which more than 80 of the students participated. I’m grateful to Linda, the librarian, and Maura, one of the English teachers, for giving me permission to use these photos on my blog.